Photo Release -- Northrop Grumman Sponsors the Newest Naval Aviation Photo Book "FLY NAVY: Celebrating the First Century of Naval Aviation"
BETHPAGE, N.Y. and SAN DIEGO and ST. AUGUSTINE, Fla., May 18, 2011 -- After the nation marked 100 years of naval aviation on May 8, 2011, Northrop Grumman Corporation (NYSE:NOC) is proud to announce its exclusive sponsorship of FLY NAVY: Celebrating the First Century of Naval Aviation , a tribute to the Centennial of Naval Aviation and the men and women of today's naval aviation community. Readers of the 372-page, full-color book, featuring over 700 photos, can experience the excitement, power, motion and beauty of naval aviation through the lens of preeminent photographer Erik Hildebrandt, a Long Island native now residing in Minnesota. For the past two years, Hildebrandt has traveled the globe documenting the vast universe of modern naval aviation. He has flown with deployed forces over war-torn Afghanistan, through the tranquil skies over Hawaii with the Blue Angels, and practically everywhere in between. FLY NAVY is his unprecedented historic record of the Navy's men and women hard at work on the eve of this year's centennial celebration. In FLY NAVY , Hildebrandt showcases manned and unmanned aircraft flown by the U.S. Navy, Marine Corps and Coast Guard including Northrop Grumman's E-2D Advanced Hawkeye, E-2C Hawkeye, C-2 Greyhound, F-5 Tiger, MQ-4 Broad Area Maritime System Demonstrator (BAMS-D), EA-6B Prowler, F-5 Tiger, the now retired F-14 Tomcat, as well as the Navy's EA-18G Growler and F-35 Joint Strike Fighter. Essays and artwork from such iconic figures as Barrett Tillman, Sergei Sikorsky, Robert "Hoot" Gibson and Hank Caruso are featured as well as a special tribute to the men, women and aircraft of Grumman Ironworks, co-authored by Leroy Grumman's son, David, and veteran retired Northrop Grumman public relations professional John Vosilla. Over its 80-year history, Northrop Grumman has delivered over 26,300 aircraft to the U.S. Navy and Marine Corps. "We're honored to be the exclusive sponsor of Erik's one-of-a-kind project especially as we join with the naval aviation community to celebrate the first 100 years of naval aviation, and work to advance the next 100 years," said Gary Ervin, president of Northrop Grumman Aerospace Systems. "It's a spectacular book with amazing photos and compelling narrative." FLY NAVY gives readers both a sneak peek inside the cockpit of some of the world's most advanced aircraft and insider access into the minds of those who spent their careers catapulting from a perfectly good ship into the unknown sky above. "Our military, and the Navy specifically, is in the midst of a technological transformation unlike anyone has ever seen in modern times. FLY NAVY is a celebration of naval aviation inspired by passion, by the art of flight at sea," said Hildebrandt. "My goal with this book was to capture both the art of machines in their environment and the passion of the aircrew and maintainers. It is a visual anthology of contemporary naval aviation at its century mark, with respectful glances at the past and glimmers, too, of the future." In FLY NAVY , Hildebrandt captures naval aviation in all of its glory. 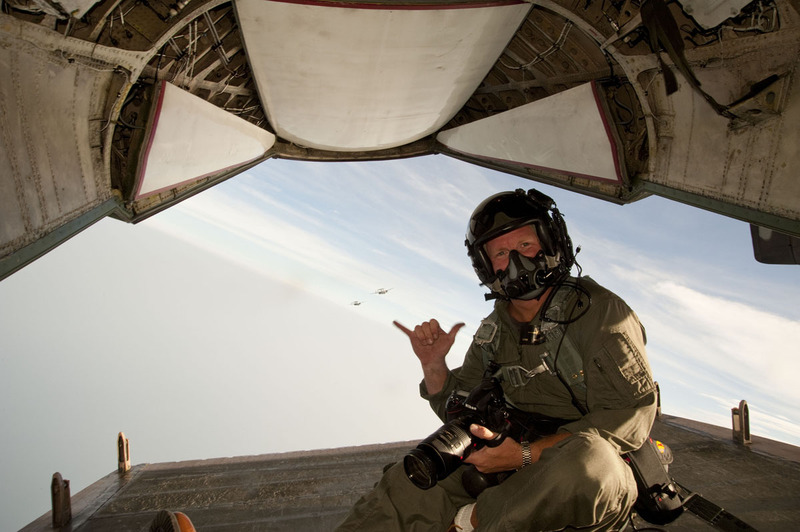 His insightful, artistic vision results in remarkable photographs that tell the stories of each aircrew and aircraft as readers ride along on incredible real-life missions. The book gives voice to the men and women behind the machines from the polished acrobatics of the Blue Angels and the intensity of novice pilots learning to touch down on the carrier flight deck to the sting of sand and the overpowering heat experienced by an air ambulance team above Basra, Iraq. In FLY NAVY , Hildebrandt lets readers see, hear and feel what it is like to fly the aircraft and live the dream—whether wearing aviator's wings or supporting those who do. "The Navy is the face of America to the globe, whether delivering humanitarian relief amid natural disaster, conducting scientific observation or fighting the nation's wars. This book is for all those who dream of being a part of that world," said Hildebrandt. " FLY NAVY is perfect for civilians who are looking to catch a glimpse into military flight operations, as well as the families and friends of servicemen and women interested in what their family members do on deployment. I also hope it will be enjoyed by aircrews past and present, who have all lived this life and treasure the memories of their service." FLY NAVY is available for purchase online at www.FlyNavyBook.com in a leather-bound version or standard hardcover. To preview FLY NAVY , visit http://media.globenewswire.com/cache/189/file/10542.pdf . Erik Hildebrandt is one of the nation's premier aviation photographers who continue to pioneer new technologies and revolutionary techniques to capture innovative aerial images. Hildebrandt has authored eight world-class coffee table books on a variety of aviation subjects including the Front Row Center series that follows the American air show circuit and Anytime, Baby! , a historic volume chronicling the last six units ever to fly the U.S. Navy F-14 Tomcat. For more information about Northrop Grumman's role in the Centennial of Naval Aviation, please visit www.northropgrumman.com/naval100 .